A few days ago, the Telegraph posted an article, The 9 Worst Things to do in London, and while I whole-heartedly agree with some of their points (the Circle line at rush hour is a particularly potent glimpse of hell), I have to disagree on their points about Brick Lane. Brick Lane is a curry filled, neon-sign lit, busy, bustling mess. It’s a pain to navigate from one end to the other on a Sunday. Coming home from work, I’m usually treated to at least five different men muttering “Curry?” at me, but it is not what I would call a “gauntlet of horrors”, as the Telegraph wrote. As a local, I tend to avoid Brick Lane on Sundays if I can help it, due to a combination of the influx of tourists and my notorious lack of patience, but I can see why it draws the crowds. It’s busy, sure, and messy, yes. And definitely in recent weeks, even maybe a bit seedy at times with the rise of men on street corners selling nitrous oxide in balloons (What is with that? Go away). However, despite all this, it’s one of the few places in London that isn’t covered in chain stores. (In fact, the only one I can think of is a Subway at the top, across from the beigel shops, and yes, I was horrified when that appeared.) It’s busy, sure, but the people are lively and colourfully and interestingly dressed. The street art makes the walls stand out. The shops are cute and quirky. Yes, there are people selling tat spread out on towels, but there’s some pretty cool stuff to be found too. I’ve picked up quite a few used books, and the guy selling old cameras always catches my eye. There are definitely quieter, classier, milder places in London. 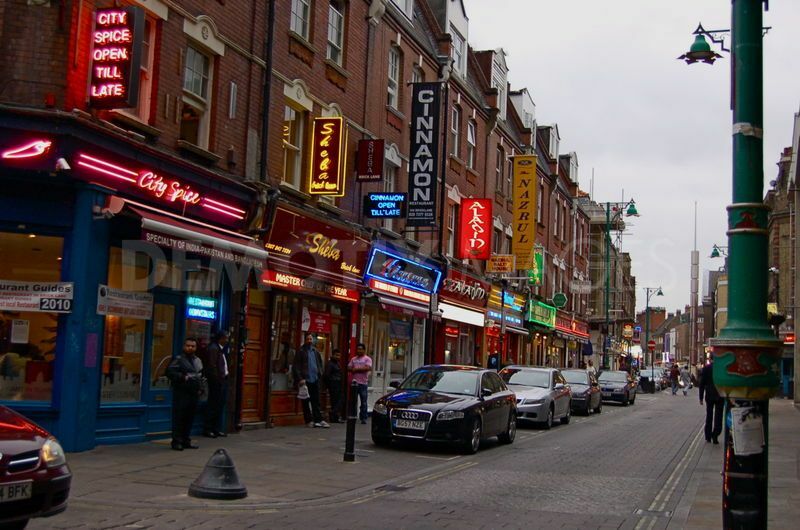 And if Brick Lane is not your bag, then by all means, check some of these other places out. I fell in love with Shoreditch and the surrounding areas because of the life and the soul of the place, the colour, the vibrancy. You don’t get that in other parts of London. London is a big, exciting city, but there are a lot of parts that are bland and clearly for the moneyed who think bland is classy. And that’s fine. But East London is not Chelsea – thankfully! If you’re going to go to Brick Lane, accept it what it is, and see the fun and the life in it. Accept that it’s bright and messy and loud and colourful. Accept that it’s going to be a bit busy, but its just full of people out to have a good time. Accept that you will get asked if you want curry, but if you do give in, it’ll probably taste pretty damn good. Accept that there are lots of people selling lots of junk, but it makes for an interesting “Who would ever buy that?” browse. Accept that the bagels are amazing, that Brick Lane Coffee is delicious and that the Brick Lane Bookstore is probably the nicest shop you could find. Accept it for what it all is, the whole lot of it. And if you can’t, no worries. There’s always South Kensington.